Brass Bellpull 7146  - $7.50 : Yarn Tree, Your wholesale source for cross stitch supplies. Item 7146. 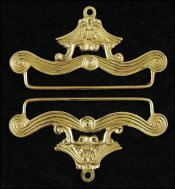 Cast brass bellpull measures 5¾” overall; mounting rods measure 4” or 10.2cm. Top and bottom are identical, so you may use as a set or for two different bellpulls. You may attach a decorative tassel to the bottom as a lovely finishing touch. Sold as a pair. >>> SALE PRICE <<< was $18.00.